Americans are on the road to greener vehicles. Over the last five years, the number of SUV models getting at least 25 miles per gallon (mpg) has doubled, while the number of car models achieving at least 40 mpg has increased sevenfold. By 2025, cars and light trucks will be almost twice as efficient as new cars are today, thanks to recent greenhouse gas and fuel economy standards from the U.S. Environmental Protection Agency (EPA) and Department of Transportation (DOT). These lower fuel costs are expected to save drivers an average $3,400 to $5,000 over the life of the vehicle, compared with 2016 cars and trucks. A greener fleet of vehicles is also good news for the planet, as passenger cars and light trucks account for about 16.5 percent of U.S. greenhouse gas emissions. Research shows that new policies can drive efficient vehicle use even further, lowering emissions and saving consumers money. While fuel-efficient vehicles like hybrids are taking off, next-generation vehicles like electric and hydrogen-powered cars and trucks are also approaching their heyday. 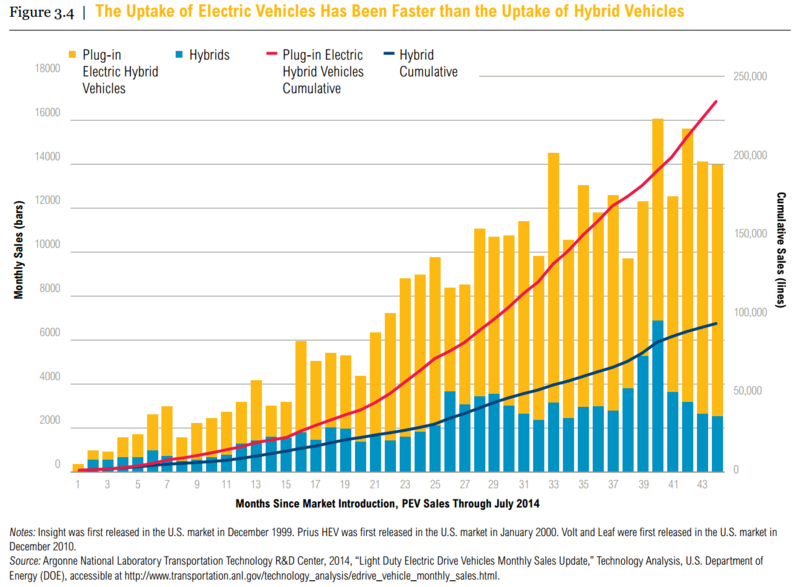 In fact, the first three years of plug-in hybrid and electric vehicle sales significantly outpaced hybrids’ first three years on the market. 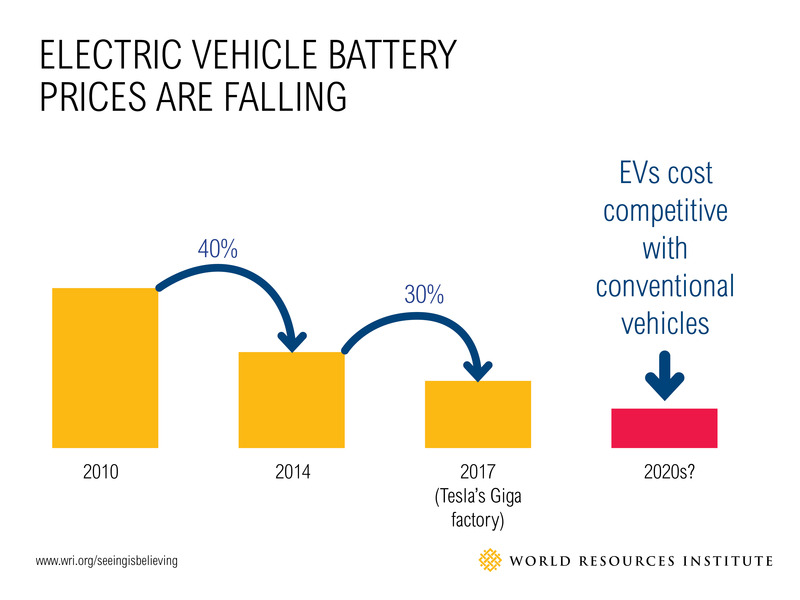 In addition to federal and state measures like tax credits and the eight-state mandate to put 3.3 million zero-emission vehicles on the road by 2025, the 40 percent decline in battery prices over the past four years also pushed clean vehicles forward. Electric vehicle battery prices are likely to drop even further—Tesla believes that its “gigafactory” will drive prices down another 30 percent by 2017 (or possibly sooner). This could culminate with electric vehicles becoming cost competitive with more conventional vehicles in the early 2020s, which the Department of Energy predicts. Hydrogen vehicles are showing great potential as well. Toyota recently announced it will begin selling its Mirai fuel cell car in late 2015, with several other large car manufacturers (including Honda, Hyundai and Mercedes) also planning to commercialize hydrogen cars through 2017. Perhaps the greatest advantage presented by hydrogen cars and trucks is that fuel cells can store a lot more energy than current electric vehicle batteries, so cars can travel further between refueling/recharging stops. The EPA’s current fuel standards are already helping make new vehicles more efficient. And, if technological progress continues, it should be easier and more cost effective to meet the agency’s 2025 fuel economy and emissions-reduction requirements. Public and private funding can help increase the number of alternative fuel stations, such as electricity and hydrogen, to give drivers a sense of security that their car won’t lose its charge before getting to a recharging station. This type of investment would also provide the certainty auto companies need to commit to alternative-fuel vehicle manufacturing. Federal and state regulations or mandates could help improve charging options by eliminating barriers to access, such as ensuring all charging stations are public as opposed to private networks. They can also help utilities to use energy stored in electric vehicle batteries as a backup source of power for renewable energy users, saving money for grid operators and vehicle owners. Congress should increase federal funding for research and development for next-generation technologies to help the United States become a leader in alternative vehicle manufacturing. Federal and state zero-emission vehicle mandates and tax incentives to promote sales of alternative vehicles should be sustained and expanded to bring lower-cost alternative vehicles to market faster. Tune in for our next installment of the Lower Emissions, Brighter Economy blog series, where we’ll explore the economic benefits of reducing methane emissions from natural gas. See also our related publication, Seeing is Believing: Creating a New Climate Economy in the US.